STICK INSECT CARE The right pet for you? Stick insects are relatively easy to keep and can be interesting to look at. Before getting any pet, you should think very hard about whether you can provide everything it needs. What do stick insects need? Companionship - to be with other stick insects (but kept apart from other insect types). A diet of fresh leaves. Most types of stick insect will live on bramble, but the Indian stick insect also eats privet, hawthorn and rose. These leaves should be kept on the twig and stood in a pot of water, with a cover to prevent the insects drowning. Avoid any leaves that may have been sprayed with pesticide. Spray the leaves with water daily and change them once a week. The floor of their home to be lined with paper, which should be changed once a week. Be careful to keep an eye on the stick insects while cleaning out the home, so that they are not thrown out with old plants. A large, well-ventilated home, that is kept indoors in a warm place out of direct sunlight. They should have plenty of room to climb out of their skins. To be allowed out to fly occasionally if they have wings. To be left alone just before they shed their skins and for a few days afterwards. To be looked after when you are away on holiday. Life span Stick insects live for about 12 months. Behaviour Stick insects should be kept with other stick insects but must not be overcrowded. They may fight and even eat each other if they are not given enough water, are fed incorrectly or do not have sufficient space. Handling Stick insects are very delicate and should be handled with great care. It is best to pick them up with an artist's paintbrush. 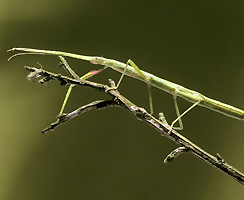 In some species of stick insect, females produce fertile eggs without mating. This is known as parthenogenesis. Stick insects will lay between 100 and 700 eggs in a clutch, depending on the species. Eggs should be collected and carefully destroyed. Health If a stick insect loses a leg, this is not fatal as it will grow another one after its next skin change. A stick insect that is twitching has probably eaten leaves that have been treated with pesticide and it is likely to die. If a stick insect has problems shedding its skin, you can help. When the stick insect looks fat, gently moisten the old skin and carefully peel it away. Stick insects may suffer from mites if their home is not kept clean and well-ventilated.